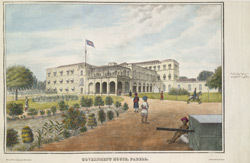 bl.uk > Online Gallery Home	> Online exhibitions	> Asia, Pacific and Africa Collections	> Government House, Parell. Plate two from J. M. Gonsalves' "Views at Bombay". This building at Parel in Bombay was originally a Portuguese Franciscan friary, completed in 1673 and taken over by Governor Boone in 1719 as a country residence. In 1771, when Hornby first resided here, it became the new Government House in place of the original one in the Fort area. The banqueting hall and ballroom were housed in the shell of the original vaulted chapel. In 1899 the Plague Research Laboratory founded by W M Haffkine was established here. Since 1925 it has been known as the Haffkine Institute and the original grounds now contain a number of medical institutions.